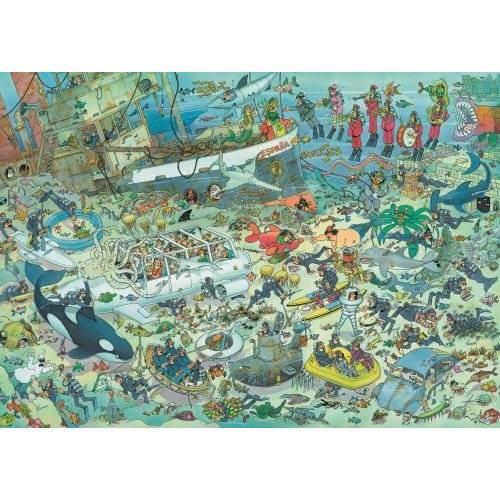 Deep Sea Fun is the title of this hilarious 1000 piece Jan van Haasteren jigsaw puzzle and, as with all of his popular illustrations, you are sure to find this puzzle extremely enjoyable while laughing at all of the individual goings on within. 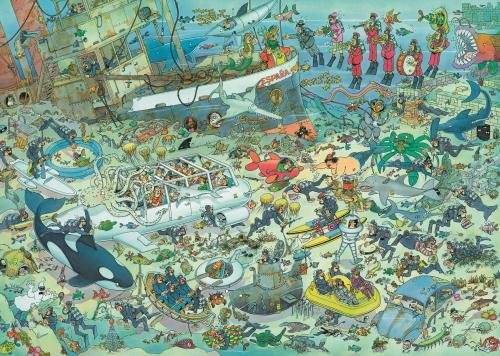 The finished puzzle image illustrates an underwater adventure, or as titled – Deep Sea Fun. In this underwater kingdom you can find Saint Nicholas with what appears to be a fish swimming out from under his miter as a couple preparing to be wed swim in front of him. Public transport seems to be the same underwater as you see passengers crammed into a sub-bus that is being hijacked by an octopus and swordfish along the sea bed, after narrowly avoiding a scuba diver hanging onto the fin of a killer whale. If this small taster of the illustrations in this puzzle sounds like your cup of tea, then don’t miss out on the fun of piecing this puzzle together because there are many more hilarious illustrations to be enjoyed. The finished puzzle is extremely colourful and is the perfect way to enjoy a few afternoons or evenings, because it is sure to keep you entertained as you laugh away at all the hilarious imagery you has produced. 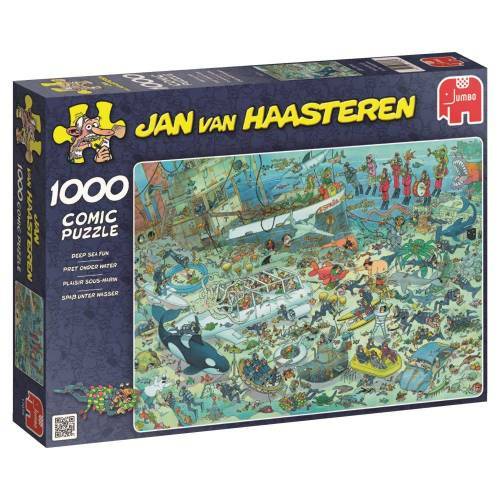 Most of Jan’s fans will immediately search for his trademark – the shark’s fin – featured in every puzzle. But you can also for look for Jan’s other favourites – Saint Nicholas, The Hands, The Dentures and a self-portrait of Jan – that can be seen in nearly all of his puzzles. But if you have never puzzled a Jan van Haasteren before, then be sure to look out for these things. The completed puzzle will measure 68 x 48 cm (approximately). Jan van Haasteren has been creating amusing drawings exclusively for Jumbo for several decades. His drawings have a distinctly recognisable style - humorous images, hilarious situations and far more people than you would expect to ever see in a puzzle! 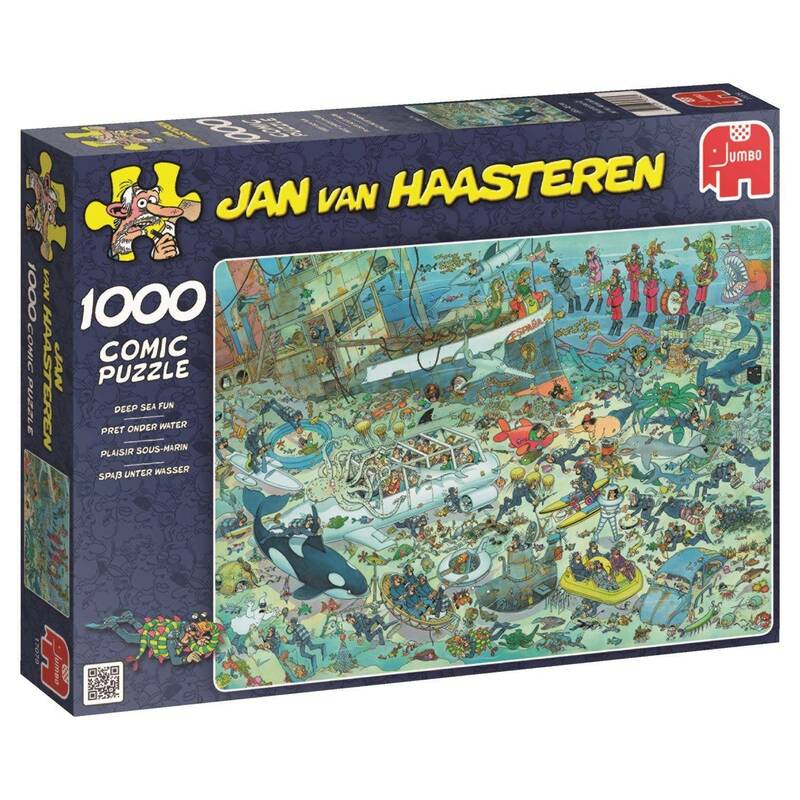 The pictures produced by Jan van Haasteren are extremely popular worldwide and he has created more than 80 puzzles to date.